Since the very early days of making and exhibiting ceramics I have always strived to document my work with eye catching imagery understanding full well that “a picture says a thousand words”. A good photograph is always sought after by event organisers and gallery owners for festivals and exhibitions and I have been fortunate enough over the years to have had some of my images chosen for such use. A good image is attractive to collectors and enthusiasts so the benefits for all concerned can not be overstated and consequently I have become mindful and observant of the power of the poster, flyer and all things promotional. One promotional campaign that caught my attention, Ceramic Art London 2017, the thirteenth event, was indeed incorporating a powerful and arresting set of photographs. They had the essential qualities that defined the prestigious nature of the show. 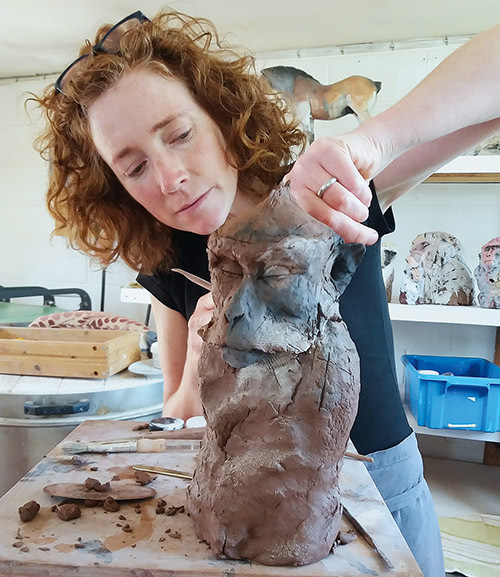 Those images depicted the work of Nichola Theakston, an artist that if asked the question would describe herself as a sculptor who happened to choose clay as her medium. Baby Mainstream met artist Sarah Pschorn in Leipzig, where she currently lives and works. She spoke to her about her work, modern technology and the Baroque. Baby Mainstream: Your work seems like collages of various styles. Am I right? Yes. In my work I link various eras and styles, currently Pop with the Baroque in particular. This often leads to bizarre mixtures. Baby Mainstream: You are very interested in past eras and the artisanal products from these periods. What is it that fascinates you so about them? I think you can learn a lot from the past. I am particularly interested in the Baroque. 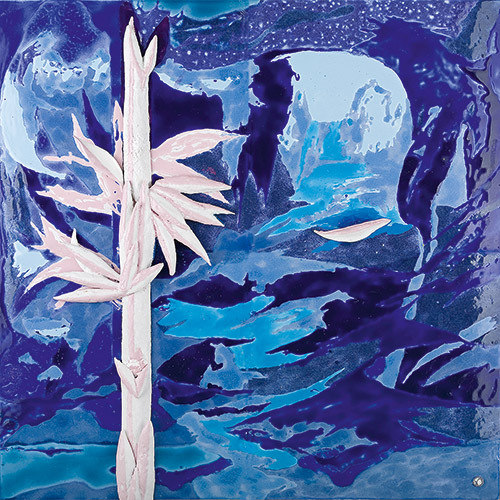 My ceramics in recent years have resulted from a study of early Meissen porcelain, which at this time of course was discovered as the first porcelain in Europe. My view of the Baroque is coloured with admiration and an affectionate sense of irony. Beate Pfefferkorn recently returned from Fuping. In 2016, she won third prize in the Emerging Artist Award of the International Ceramic Art Museums and was invited to China for the award ceremony. She began the four-week residency in Fuping, as a part of the prize, in October 2017. Beate Pfefferkorn has always enjoyed meeting the challenge of public competitions. 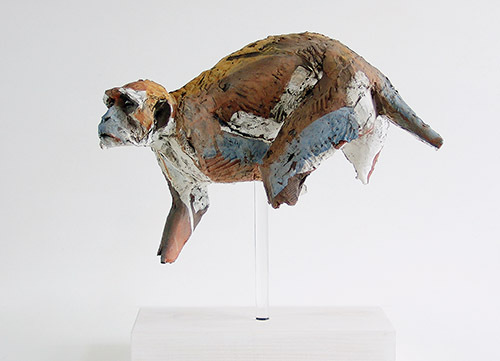 She was selected to exhibit in the Perron Kunstpreis as well as the Frechen, Westerwald and Diessen Ceramics Prizes. 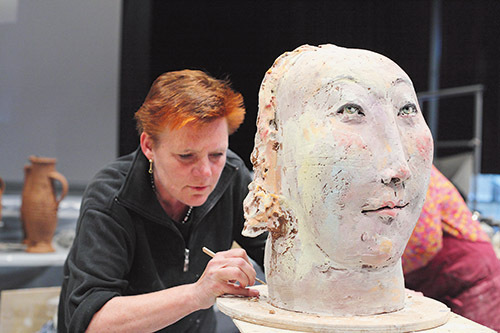 She received her first major distinction in 2013 with the 2nd prize in the Hesse State Prize for German Craft. Then the international market opened up for her. Her big necklaces have been shown on the runways of fashion shows at the Museum of Art and Design in New York and the Musée des Beaux Arts in Montreal. 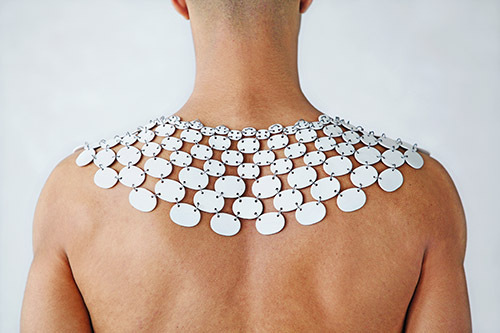 In 2016 the necklace Green Fleece was selected for the Martinsons Award in Latvia and in 2017 she was in South Korea to take part in the 10th Cheongju International Craft Biennale. But Fuping was an important event in her working life. 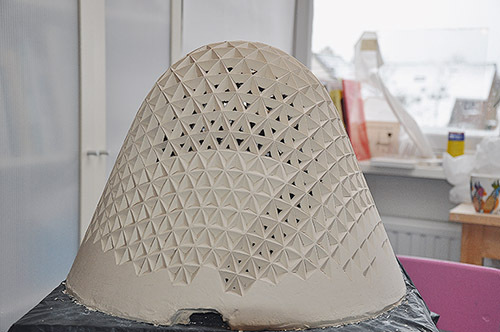 From an early stage, Pfefferkorn knew she wanted to study in the ceramics department at Burg Giebichenstein University of Art and Design in Halle. 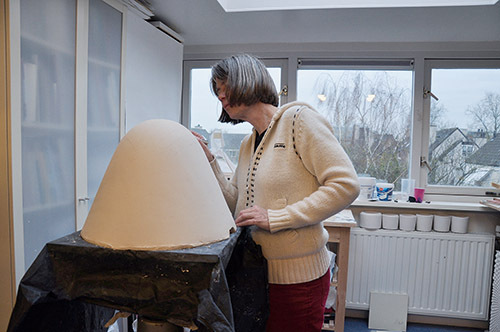 In 2002, she began in the sculpture course. Frank Steyaert’s work does not conform to any trend. For him it is just about the joy of creating. He has an incredible eye for detail. 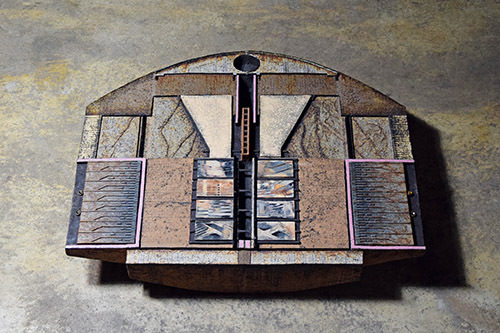 Frank Steyaert is one of the most striking personalities on the international ceramic art scene. He can look back on a long, continuous career in which he created many diverse objects of a uniform quality. 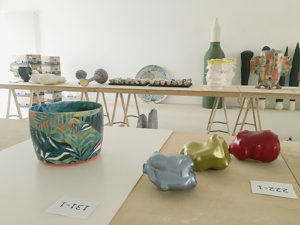 A retrospective exhibition, recently shown at the Centre Keramis in La Louvière, Belgium, not just illuminated the highways of Steyaert’s career – his ceramics – but also the byways, such as works on paper, jewellery, furniture design and architectural work. It is not easy to determine the exact starting point of his career, as Steyaert came into contact with ceramics at a very young age and has been working with it continuously ever since. Even as a child, he derived much pleasure from creating things using different materials. He accidentally started working with clay. Frank’s father was a dealer in building materials and when, one day, a new delivery of bricks had arrived, they discovered one unfired brick. At first, it was carelessly tossed aside, but a few moments later they came up with the idea to put it in water and mould it into a ball of clay. It became Frank’s favourite toy. Following deliveries of bricks from the brickyard would contain even more unfired bricks. He created countless playful figurines and a „large Noah’s Ark“ containing every animal Frank could think of. He was unstoppable. How should we imagine a notion emerging, an idea that we want to put into shape? What are all the things that condense to form an image? Which part of this is thinking inspired by the surroundings and which part is down to predisposition? It does not matter whether the resultant object is called craft or art; through inspiration it is stimulated to create new things. In the past inspiration was divine afflatus, and even now one may be kissed by the muse. In 1926, Einstein wrote to Max Born, “The theory says a lot, but does not really bring us closer to the secret of the ‘Old One’.” Goethe’s eternal immutable laws induced Einstein to claim that God does not play dice. Research has led to the surprising result that the laws governing big things do not apply in the very smallest dimensions. Klaus Mainzer wrote a book entitled Der kreative Zufall. Wie das Neue in die Welt kommt (“Creative Coincidence. How new things come into the world”, published in German by Verlag C.H.Beck). It deals with objective coincidence in physics, chemistry, information technology and evolution theory. For us though there is a different kind of coincidence. And the new things that come into the world are different too. A little earlier than usual, Ceramic Art London took place again, from 16-18 March 2018. Internationally, it is one of the most important trade shows for direct sales of high quality ceramics. For the third time now, the expo took place at Central St. Martins, the London College of art, which is now firmly established as an event venue,.and is the last college in London still offering B.A. and M.A. courses in ceramics. 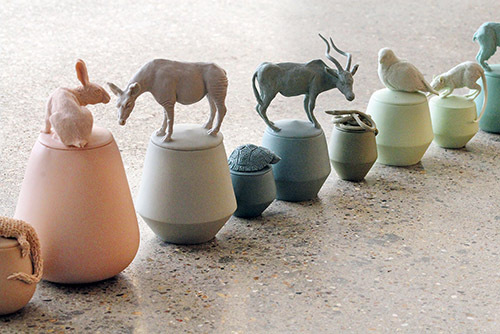 It was also the 15th anniversary for the show, which was launched in 2003 by the British Craft Potters Association. 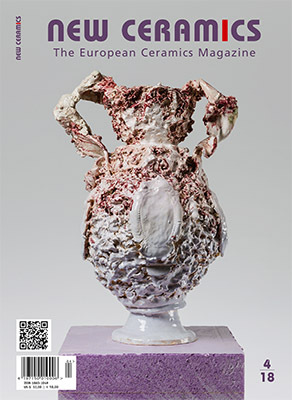 Like every year, there were many exhibitors – a good quarter – who undertook some very long journeys to attend this important event in the international ceramics calendar. South Korea was especially well represented. Exhibitors Sunjoo Oh, Jaejun Lee, Hyu Jin Jo, In Ho Song, Sewon Minn mainly showed beautiful vessel ceramics and objects. But there were also returning and new exhibitors from Germany: Joachim Lambrecht, Christiane Wilhelm, Ross de Wayne, Monika Debus, Barbara Hast, Kiho Kang; France: Françoise Dufayard; Brazil: Annelise Bredow; Ireland: Graine Watts, Adam Frew, Isobel Egan; Netherlands: Marike Jacobs; South Africa: Clementina van der Walt; Portugal: Guilherme Ferias; Spain: Roger Coll. 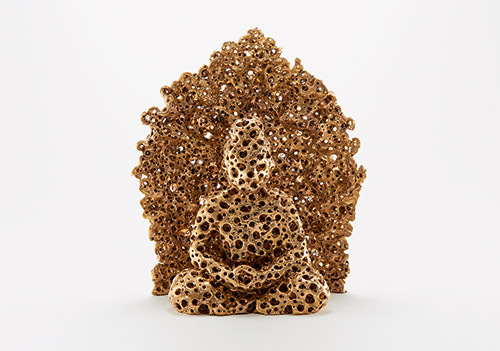 For Collect, the annual fair for contemporary objects, the Saatchi Gallery in London once again opened its doors in February this year. Forty leading galleries presented works in glass, metal, ceramics, textiles and wood, made by over 400 artists from 13 countries, filling all three floors of the building. I would like to restrict myself here to the ceramics, which I found particularly appealing. Oxford Ceramics Gallery also presented small-scale vessels by Stair together with metal objects by Simone ten Hompel. Under the heading, „working with…“, the gallery presented work that had been made in special cooperations. Guebwiller discovered its love of ceramics with its famous son. Théodore Deck, who was born in this Alsatian town in 1823. He was one of the best known French ceramists from the Art Déco period and his faience work with his typical turquoise glaze became world famous. A museum has been dedicated to him in the centre of Guebwiller. However, in the world of French ceramics, for some time now Guebwiller has been synonymous with a successful training concept for ceramists. Founded in 2004 as an association, the IEAC (Institut Européen des Arts Céramiques) started out with new ideas. In one year of intensive study, 8-10 students are trained so that they can hold their own on the market as professional artist-craftspeople. 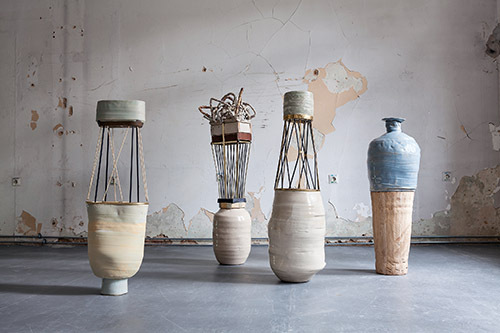 „What makes us unique amongst ceramic training institutions is our close links to contemporary ceramic art,“ explains the director, Isabelle Rabet. These links are established by involving visiting lecturers whose names read like the Who is Who of the French ceramics scene. Irina S. Zaytceva was born in Russia in 1957, emigrated to the U.S.A in 1990. Academic background: M.F.A. with a major in book illustration. 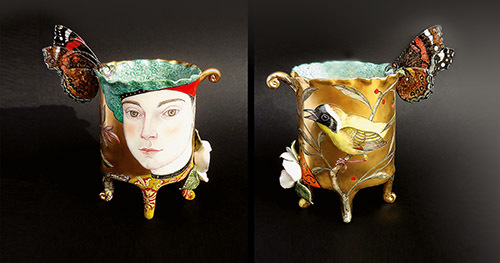 A technical master of drawing, Zaytceva is proficient in constructing story scenes with rich narratives on porcelains. Her cups, vessels or figurines with subtle compositions picturize humanity or stage the abundance and splendour of nature. These sophisticated faces and features, or the creatures and flowers in nature, epitomize the fertility and opulence of the world. 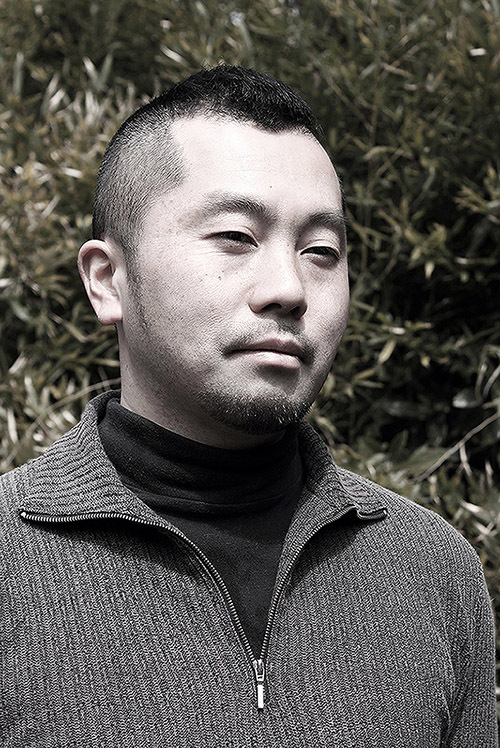 Tetsuya Ishiyama was born in Sayama, Saitama Prefecture, Japan in 1973. 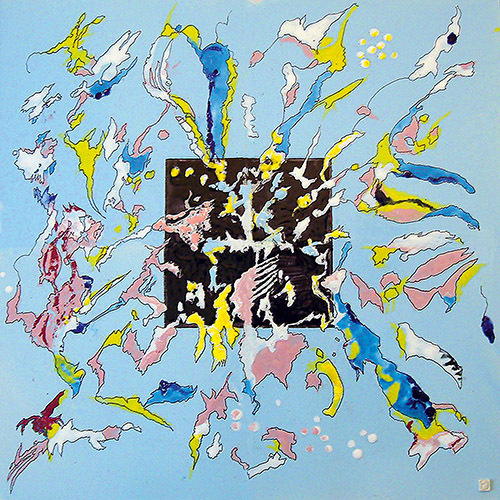 Ishiyama is a self-taught artist, but he has a natural command of professional techniques in creating large-scale works, as well as an ability to harmonize the whole and organize the details. He was born with artisan-like hands capable of displaying the unique character and beauty of both the large sculptural works and vessels such as tea bowls. 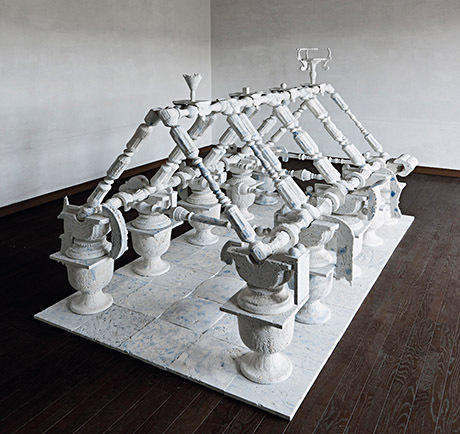 Beatrijs, last year you won the New Ceramics Prize at the Oldenburg International Ceramics Fair. Congratulations again. What does this success mean to you? The prize means a lot to me. It means recognition from ceramics lovers and colleagues, which shows that they appreciate my work. The introduction from Martin McWilliam was a tribute in itself and I am very glad that abstract forms still have a place in ceramics. And then the invitation to exhibit at the Landesmuseum is a real challenge for the artist. A very special space like this makes great demands on me.